Ana Ivanovic vs Svetlana Kuznetsova, originally uploaded by bill kralovec. 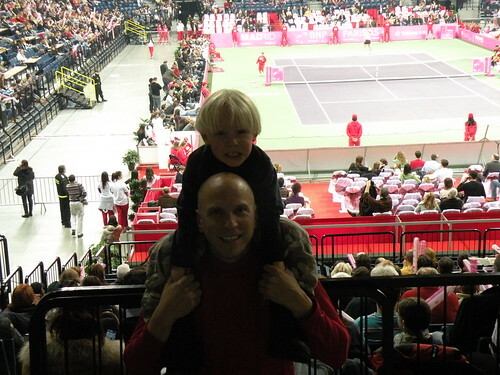 Saturday we went to the Belgrade Arena to watch the first singles matches of the Federation Cup Tennis Tournament. The Fed Cup is the women’s version of the Davis Cup. Serbia is playing this weekend in the quarterfinals against Russia. We also watched the reverse singles and doubles matches on RTV (Radio Television Serbia) on Sunday. With four singles matches and one doubles match, whichever team wins three, wins the “tie” as they say in tennis jargon. Russia defeated Serbia 3 matches to 2. Ana Ivanovic was awful and lost her two singles matches and was the “weak link” in the doubles match she played with Jelena. Serbia as you may know, is a power in world tennis because of the big three, Novak Djokovic (#2 ATP ranking), Jelena Jankovic (#8 WTA ranking), and Ana Ivanovic (#23 WTA ranking). Jelena and Ana make a duo that can match up with any pair of women in the world. Russia, is currently in my opinion, the top women’s tennis nation with 6 players in the top 20 and 15 in the top 100. The number two ranked player in the world, Marat Safin’s sister Dinara, was not playing, but we saw world number 4, Svetlana Kuznetova play. In the first match, Ana Ivanovic (above) lost in straight sets to Kuznetova. She looked horrible in the first set, rallied in the second set to lead 4-2, before collapsing. I thought she looked rushed and off balance most of the match. Both Nadia and I remember watching her a couple of years ago defeating Venus Williams. She showed flashes of that, but mostly showed a very inconsistent effort and lack of intensity. In the second match, Jelena Jankovic played much more aggressively and defeated world #31, Alisa Kleybanova in three sets. Jelena came back on Sunday and won again in three sets, defeating Kuznetova. She never gave up, played with great intensity, and I have a newfound respect for her. I hope she wins a Grand Slam this year and makes a push for #1. Ana looks like she has a long way to go to be back in the top 10. It would be nice to see her dedicate herself to training and the tour this year and get back into the elite of the women. One of the most noticeable things about yesterday’s matches for any male, was the beauty of the Serbian girls. I enjoyed the tennis and respect the athletic ability of the women, but it is natural to notice things like that. Both Ana and Jelena are slender and carried themselves with a more feminine air than their Russian counterparts. They both play up the “babe” factor on their web sites (Jelena’s web site and Ana’s web site)and when they promote themselves. I felt they were at a disadvantage against the bigger, stronger, Russian girls yesterday. I think both of them would benefit from strength training. The Russians looked like linemen (North American football reference – these are the players that push against each other to create clear lanes for the faster and smaller running backs) and not what I think of as tennis players. Both girls are listed at over 150 pounds on the tour web site. I also think Serbia should develop their women’s sports program significantly. Walking around Belgrade, I see a lot of tall (6 feet and over) women. With the history of success of the men’s basketball, I am surprised that women also haven’t done more. It might be that women don’t regard themselves like American women athletes do. They are more likely to stop competing in sports as adults and girls are not really encouraged and clubs and schools do not have female sports programs. I would like to start a women’s club program like Partizan, to develop women basketball players. Many would earn US university scholarships and they would be a force on the world basketball scene. In the US, law dictates that schools must have equal male and female sports programs. This has definitely helped women in the USA.